Blue Valley West forced five turnovers and rolled to a 53-6 win over Blue Valley Southwest. The Jaguar offense was equally impressive in putting up 518 yards of total offense, including 306 yards on the ground. Abe Lawrence led Blue Valley West with 191 yards and a score, while Edgar Hunley rushed for 97 yards and two touchdowns. Quarterback Greg Riddle passed for 212 yards, including two touchdown passes to David Brown who caught eight balls for 177 yards. Dodge City won back the Hatchet for the first time since 2015 with a 27-7 win over rival Garden City on Friday night. The Red Demons used two Beau Foster touchdown runs and a 30-yard Jaiel Johnson sprint to build a 20-0 halftime lead. Tye Davis scored in the third quarter to provide the only points of a turnover-filled night for Garden City. Jaiel Johnson led Dodge City with 227 rushing yards and a touchdown. With the win, the Red Demons improve to 4-3 on the season and currently sit ninth in the standings on the western half of Class 6A. Manhattan rolled to a 56-6 victory over Topeka West on Friday night to improve to 6-1. Kalen Rauch rushed for 77 yards and three touchdowns and Javon Peoples added a team-high 136 yards and a touchdown for Manhattan. Indian quarterback Dane Aschenbrenner rushed for 78 yards and a touchdown and passed for 55 more yards and a touchdown. Manhattan’s Kevontae McDonald sat out the game due to a minor injury. Wichita West improved to 4-3 on the season with a 57-21 romp over Wichita South. The Pioneers jumped out to a 30-7 halftime lead and expanded it to 44-14 after three quarters. Wichita West has won three straight games since consecutive losses to Kapaun Mt. Carmel, Bishop Carroll, and Wichita Northwest earlier this season. Topeka Seaman scored in the fourth quarter and then blocked a Junction City field goal attempt to preserve a 21-20 win. Kody Wohletz’s touchdown run early in the fourth quarter gave the Vikings a 21-20 lead, and Seaman blocked a Junction City field goal attempt on the next possession. Seaman then ran out the remainder of the fourth quarter for the one-point win. Kobe Jones rushed for 136 yards and Sam Payne added 79 yards and a score for the Vikings. Wohletz rushed for 56 yards and two touchdowns, including the game-winning score on six carries. KC Schlagle picked up its fifth win of the season with a 44-15 decision over KC Washington. Jaylin Richardson rushed for 163 yards and four touchdowns on 30 carries to lead the Stallions. Schlagle held the Wildcats to just 28 rush yards on 19 attempts. De Soto improved to 6-1 with a 14-0 shutout of Shawnee Heights. Quarterback Jackson Miller broke a scoreless tie with a 5-yard touchdown run in the third quarter, then hit Keegan Sturdy on a 25-yard touchdown pass in the fourth to account for the Wildcat scoring. The game was played in wet, muddy conditions that limited the offensive production to 262 yards for De Soto and 100 yards for Shawnee Heights. Great Bend overcame six turnovers in beating WAC rival Liberal, 35-6. The Panthers scored twice in each of the first two quarters in building a 27-0 lead. Koy Brack passed for 224 yards and two touchdowns and added a touchdown on the ground. Gage Fritz led the ground attack with 131 yards and two scores. Alex Schremmer caught five passes for 136 yards including a 50-yard touchdown pass from Brack. Maize South picked up their fourth consecutive win with a 23-22, double-overtime victory over then No. 4 Goddard. The Mavericks led 16-0 after a long Cory Minks touchdown. But a pair of Goddard touchdowns pulled the Lions within 16-13. Then Goddard kicker Gentry Cole drilled a 40-yard field goal to send the game into overtime. Neither the Mavericks or Lions could score on their first overtime possession. But Goddard took the lead in the second overtime on a Kyler Semrad touchdown pass to Blake Mitchell. The Lions’ PAT was blocked leaving the lead at 22-16. Two plays later, Minks scored on a short pass from Colin Shields on the Mavericks’ possession to tie the game at 22, then kicker Ethan Wiens added the PAT for the 23-22 win. Spring Hill snapped a three-game losing streak with a 24-22 win over KC Piper. The Broncos got 170 rushing yards and two touchdowns from Zade Barker, including a touchdown run with less than five minutes remaining that put Spring Hill up 24-14. Piper scored on a Devon Marshall touchdown catch from Dalton White with less than a minute to go and converted the two-point conversion to pull within 24-22, but couldn’t get any closer. Bryce Krone rushed for 207 yards and three touchdowns as Bonner Springs raced past Leavenworth, 55-34. Krone’s total pushed him to within six yards of the 1,000-yard mark on the season. He has rushed for 994 yards and 12 scores this season. Quarterback Noah Villarreal passed for 169 yards and a touchdown and added 104 yards rushing with a score. Senior A.J. Watson caught nine passes for 127 yards and a touchdown. Wellington won went on the road and defeated Winfield, 22-7. Grey Hatfield rushed for 160 yards and a touchdown on 35 carries to lead the Crusaders. Michael Ledbetter threw a short touchdown pass to Silas Poppelwell to give Wellington a 14-0 lead. The Vikings closed the score to 14-7 on a 10-yard Jack Mull run in the fourth quarter, but Wellington’s DeAndre Washington returned a fumble for a touchdown late in the game for the final margin. Wellington has now won six games for the first time since the 2009 season. Towanda-Circle rallied from down 34-12 at halftime to beat Independence, 40-34. Circle senior Corbin Ingrim rushed for 141 yards and four touchdowns on 13 carries. The T-Birds scored three times in the third quarter to tie the game at 34, the scored the winning touchdown with just under ten minutes remaining in the game. 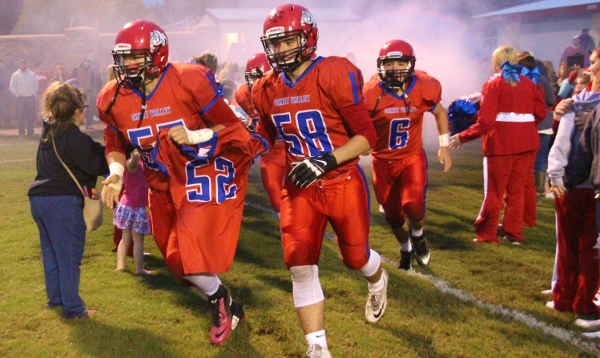 Parsons raced out to a 24-0 halftime lead and held on to win at Caney Valley, 42-22. The Vikings got the scoring started with a 41-yard touchdown strike from Gage Friess to Patrick Loadholtz. Caney mounted a drive on the ensuing possessing, but the DaQuan Johnson stripped the Bullpup ball carrier and raced 70-yards for a touchdown and a 16-0 lead. Friess later connected with Anthony Pousher on a 19-yard score for a 24-0 lead. Both teams scored twice in the third quarter, as Parsons answered a Caney score with a Dariq Williams kickoff return for a touchdown. Caney pulled to within 36-22 early in the fourth on Ben Nunneley’s second touchdown but got no closer. Friess added a pair of touchdown runs to go along with his two touchdown passes. Nunneley led Caney with 154 yards on the ground, while Eryk Kyser added 113 yards rushing. It’s been a difficult week for Caney Valley. The Bullpups played their Homecoming game against Parsons despite heavy hearts given an auto accident that seriously injured teammate Jalen Bush earlier that morning. As of Monday evening, Bush remains in critical condition in a Tulsa hospital. Topeka Hayden clinched the Class 3A, District 3 title with a 20-0 shutout of then No. 5 ranked Perry-Lecompton. Quarterback Brady Bohannon’s short touchdown run late in the first half gave Hayden a 6-0 lead and turns out to be the only points necessary on a night where the Wildcat defense dominated. Hayden held the Kaws to less than 90 yards of total offense. The Wildcat defense slowed Perry-Lecompton standout back Dalton Kellum to just 35 rush yards on 22 attempts. Desmond Purnell scored twice in the fourth quarter to provide separation for Hayden. Purnell caught a short touchdown pass from Bohannon, then scored on a short touchdown run with a little more than two minutes remaining. Prairie View clinched the District 2 championship with a 22-7 win over Anderson County. The Buffaloes scored once in each of the first three quarters to build a 22-0 lead. Anderson County then added a score in the fourth quarter with the final margin. Prairie View has won four straight since their lone loss of the season to Galena. Riley Krehbiel threw two touchdown passes and rushed for another as Kingman beat Nickerson, 31-14. John Molitor broke a 74-yard touchdown run and Krehbiel hit Hayden Albright on a long touchdown pass to put the Eagles up 14-7 at halftime. Krehbiel’s touchdown run in the third quarter extended the Kingman lead to 21-7. After Nickerson pulled within 21-14, Luis Franco connected on a 45-yard field goal to extend Kingman’s lead to 24-14. Krehbiel later hit Traegan Flanagan on a short touchdown pass for the final margin of 31-14. For the third time this season, Belle Plaine played an overtime contest. The Dragons defeated Eureka, 27-26, in overtime. Belle Plaine moved to 4-3 overall, 3-1 in district play and posted an undefeated 4-0 mark at home. In OT, Bo Gooch scored on a five-yard run, and Tristan Warren added the PAT kick. Eureka responded with a touchdown pass but went for two, and the Dragons stopped them. Eureka led 14-6 at halftime. Belle Plaine had 408 yards of total offense, including 310 in the passing game, while Eureka had 277 total yards. However, Belle Plaine committed four turnovers, Eureka none. In the season opener, the Dragons lost at Inman, 37-36, in overtime. In Week 4, Belle Plaine defeated Cherryvale, 41-40, and then beat Neodesha, 33-27 in two OTs the following week. Two weeks ago, Belle Plaine lost at Fredonia, 28-23. The Dragons have already won their most games since 2011. Norton beat Ellsworth, 35-17, for its third straight victory and moved to 4-3. The Bluejays led 7-3 after the first quarter and that margin remained until the third quarter when Norton scored 21 unanswered points. Junior Kade Melvin had a massive game with 18 of 24 passing for 386 yards with a 4/1 TD/INT ratio. He rushed 11 times for 60 yards and a TD. Senior Hayden Wiltfong had another big game with 10 catches for 142 yards and a score, while sophomore Gavin Sproul tallied three catches for 157 yards and two TDs. Melvin, in his first year at quarterback, has passed for 1,105 and rushed for 465 yards with 15 scores accounted for. Cherryvale defeated rival Neodesha, 28-12. Quarterback Cade Addis was 5 of 7 passing for 109 yards, rushed for 22 yards and tallied a score. Garrett Novotny had two scores. For Neodesha, Mason Ellis was 12 of 26 for 160 yards with a touchdown, and Toby Curtis recorded 107 receiving yards. Southeast of Saline pulled an upset against previously No. 5-ranked Riley County with a 23-21 road victory. SES trailed 21-0 at halftime. With just under three minutes left, Colby Beer sacked Garrett Harrison for a safety. Jaxon Gebhardt finished 12 of 30 passing for 157 yards with two touchdowns against two interceptions. Seth Eklund also tossed a touchdown pass. Harrison was 9 of 20 for 125 yards with a 2/2 TD/INT ratio. Senior Efren Mercado rushed for 353 yards and four touchdowns on 23 carries to lead Southwestern Heights to a 56-28 win over Ellinwood. Demetrio Flores added 181 yards on the ground with three scores to help the Mustangs secure a playoff spot for the first time since 2007. For the second straight year, Ell-Saline, a big favorite, needed a comeback to beat Sacred Heart in the Saline County showdown. Last fall, Ell-Saline won 28-21. This season, the Cardinals overcame four turnovers and earned a 14-9 victory. Sacred Heart quarterback David Anderson suffered an injury for the Knights in the second quarter. Nick Davenport led the game-winning scoring drive with 8 minutes, 33 seconds left and scored on a four-yard run. Sacred Heart nearly scored late but couldn’t complete a pass at the goal line. Treyton Peterson scored the Cardinals’ first touchdown on a 45-yard reception. St. Mary’s Colgan beat previously undefeated Pleasanton, 46-0, and moved to 11-0 all-time against the Blu-Jays. Colgan junior Andrew Lomshek recovered two early fumbles, the second one coming at the Pleasanton nine-yard line. The next play, his older brother Matthew Lomshek scored on a nine-yard run – one of his three touchdowns on the night. Colgan led 36-0 at intermission. The Panthers overall forced four turnovers and had a 417-139 edge in total offense. Plainville posted its second straight shutout and has permitted just six points since a Week 4 home loss to Smith Center. The Cardinals have clinched District 6 with a 41-0 victory against Ellis. Jordan Finnesy passed for 204 yards and three touchdowns, while Jared Casey rushed for 55 yards and a pair of scores. La Crosse held off Oakley, 24-22, with a late score. Hunter Morgan threw for three touchdown passes and rushed for a score. He delivered 144 passing and 122 rushing yards. La Crosse led 12-0 after the first quarter. For Oakley, sophomore Eric Cain stepped in at quarterback and completed 10 of 17 passes for 178 yards and a touchdown. The Leopards face Ellis for the second of two meetings this season. Ellis defeated La Crosse, 44-34, in Week 4. Victoria trailed Hill City, 19-6 at halftime, but roared back for a 42-41 road victory in District 7 action. The Knights scored three straight touchdowns in the third quarter to take the lead. Drayden Karlin opened the second half with a 75-yard kickoff return. Then, Cooper Windholz found Caden Oberle on a 19-yard pass, and Jayvon Pruitt added a seven-yard scoring run. Hill City quarterback Conner Born had another big game with 26 carries for 147 yards and six scores. Pruitt went over 150 rushing yards. Ness City defeated Kiowa County, 62-14, behind a big game from quarterback John Pfannenstiel. The 5-2 Eagles received 228 passing yards and six scores from Pfannenstiel. Ness City will play host to No. 2 Hodgeman County this week. In District 1, Oswego, one of the state’s biggest surprises under first-year coach Matt Fowler, moved to 5-2 after a 22-16 win versus Cedar Vale-Dexter. The Indians already have a four-win improvement from last year and have clinched the program’s first winning season since 2010. Oswego has won games by eight, four and six points and has a four-point loss. Oswego trailed 8-0 at halftime before a 14-8 third-quarter edge. All of the Indians’ yards came on the ground as junior Jace Wilson had 25 carries for 122 yards and a score, and sophomore Issac Elliott finished with 13 carries for 102 and two TDs. In District 3, Maranatha Academy held off Lebo, 24-20, and clinched a winning season with a 5-2 record. Junior quarterback Nate Burdette completed 7 of 18 passes for 78 yards with a 2/1 TD/INT ratio. He also rushed 20 times for 159 yards and a score. Beloit St. John’s-Tipton clinched its seventh straight winning season with a 60-0 home win versus Lakeside-Downs. BSJT is 5-2 overall, 5-0 in district play and will travel to Mankato-Rock Hills (6-1) for the district crown this week. BSJT scored 34 points in the first quarter and 26 in the second. Junior Alex Ketter completed 2 of 6 passes for 60 yards, both for two touchdowns. Sophomore Brayden Perez had 11 rushes for 208 yards and three scores. Senior Kail Dubbert had another big game with 15 carries for 90 yards and three touchdowns and caught a 51-yard scoring pass. Dubbert recorded 15 tackles, Ketter 10. Mankato-Rock Hills defeated Pike Valley, 50-6, in a game that ended in the third quarter. Rock Hills led 16-6 after the first quarter and 30-6 at halftime. Senior Zane Colson had another big game with 17 carries for 234 yards and four scores. He also finished with 26 tackles, five for loss. For the season, Colson has averaged 159 yards a game with 79 carries for 954 yards and 15 rushing TDs. Thunder Ridge, with three wins in the previous three years, clinched a winning record with first-year coach Joel Struckhoff, a former Longhorn standout. The Longhorns (5-2) defeated Wilson, 50-6. Sophomore Jacob Barnes completed 6 of 10 passes for 139 yards with a 2/1 TD/INT ratio. Five players had between 28 and 75 rushing yards as the Longhorns rushed for 264 yards and three TDs. Senior Brandon Grauerholz had another big game with five catches for 114 yards and three scotes. Junior Joseph Ferguson finished with 20 tackles. Southern Cloud won their district game, 70-44, over Linn. Carson Bellows rushed for 101 yards and three scores with Blake Gumm adding 87 yards on the ground and two touchdowns. Quarterback Morgan Coleman passed for 80 yards and three touchdowns for Southern Cloud. Linn was led by Joseph Trumble’s 101 rushing yards with four touchdowns. Trumble also caught a touchdown pass. With the victory, the Warriors have clinched a spot in the 8M-II bracket – reaching the postseason for the first time since 2013 and only the second time in the last 15 seasons. Pawnee Heights improved to 5-1 with a 41-27 win over Moscow. The Tigers were led by Kade Scott’s 315 rushing yards on 26 carries. Scott rushed for four touchdowns in the game and caught a 30-yard touchdown pass from Fabian Flores. Scott also completed his only pass for an 8-yard touchdown to Jackson Henbest. Wichita Homeschool completed a perfect regular season with an 88-66 win over Sunrise Christian Academy. The Warrior offense produced more than 600 yards of total offense led by quarterback Will Day’s 282 passing yards and 6 touchdowns. Day also rushed for 162 yards and four scores on 13 attempts. Marshal Masterson caught nine passes for 163 yards and three touchdowns, while Luke Johnson added 101 yards rushing, two scores, and 77 receiving yards and two more touchdowns.